I find CruiseDirect to have all the Mediterranean Cruises you could think of since they work with all the major cruise lines. This is a great choice if you don’t feel like checking out each individual liner site. More than a million people pass through the massive Venice Cruise Terminal beside the Ponte della Liberta Causeway (bridge between Venice’s mainland and historic island) every year, to fill more than a thousand liner departures. Royal Caribbean leaves Venice regularly with cruises to Croatia, the Greek Isles, Turkey and Spain. Costa Cruises usually leave Venice and head for the Greek Isles and Croatian coastal cities. MSC Cruise Lines offer 7 to 11-day cruises along the Croatian Coast, Greek Islands, and Turkey. Terminal Venezia Passeggeri, the far less romantic “Venice Cruise Terminal” in English, is not technically on the Mediterranean. Instead it is located at the Venice end of a 4-kilometer road that links Venice with mainland Italy (aka “Ponte della Liberta”). The narrow channel that connects it to the Adriatic Sea is called the Porto di Lido. More than twenty cruise companies do business at the terminal, and the choices are tremendous. The smaller terminal is the San Basilio cruise terminal which is attached to the historic island, but has smaller cruise ships. The most common routes from Venice are those that take in the Greek Islands, those that take you to Turkey and those that stay within the Adriatic. The shortest cruises departing from Venice are typically week-long voyages. Numerous providers offer choices such as Split, Kotor, Corfu, Katakolon, Souda, Santorini and Piraeus or Ancona, Mykonos, Piraeus, Corfu and Dubrovnik. Other cities that offer seven-day cruises stop at Bari, Civitavecchia, Hvar, Istanbul, Izmir, Katakolon, Koper, Ravenna, Sorrento and Taormina. If it is important to visit any particular city, a cruise can almost certainly be found on any given week that can accommodate that desire. A number of mid-length cruises are offered. A typical itinerary visits Athens, Kusadasi, Istanbul, Mykonos, Naples, Rome, Florence, Monte Carlo and Barcelona. Another popular mid-length cruise stops at Dubrovik, Corfu, Argostoli, Santorini, Catania, Naples, Rome, Livorno and Barcelona. Two-week cruises are usually the longest departing from Venice. It is often the case that the longest cruises dock at less ports than the shorter voyages, since the liners must spend more time at sea to get to the more exotic destinations. One popular route heads to Barcelona via Dubrovnik, Athens, Ephesus, Naples, Rome, Florence and Nice. A typical alternative features visits to Kotor Montenegro, Piraeus (Athen’s port), Kusadasi, Bodrum, Santorini, Mykonos and Split. 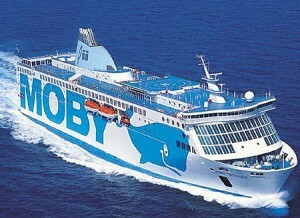 Moby Ferries depart daily from the western Italian coast and take you (for really cheap, as low as 20 euro a person!) to Elba Island (near Tuscany), Sardinia and Corsica. The Elba ride is just a few hours and you can take your rental car along with you! Snav has cruises that depart from mid-Italy and head out west towards Capri and the islands of Sorrento and Sicily. They also have cruises which leave from Italy’s east coast and heads towards Croatia. Snav’s site might be in Italian but the English language icon is at the bottom of their site.